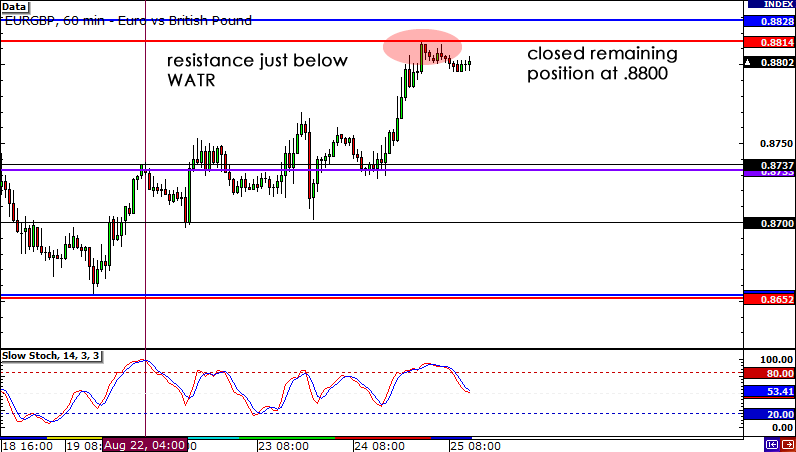 First, lemme give you a heads up on what has happened on EUR/GBP the past couple of days. We initially saw more ranging on the pair, as liquidity was as thin as Happy Pip earlier in the week. However, thanks to some dovish comments by MPC member Martin Weale and some stop hunting, we saw the pound drop across the board late yesterday. Naturally, this got me pumped up, as EUR/GBP FINALLY broke past tough resistance around .8750. Now that the pair is finding resistance at the top WATR and the .8800 handle, I think it’s time to close the door on this trade and book me some nice profits on my remaining position. I don’t know what’s gonna happen during the Jackson Symposium, so it may be better to just chill out right now. Plus, I’m not liking the doji and Stochastic on EUR/GBP’s 4-hour chart. Just so you know, my second position was slightly bigger than the 1st one, which explains why I gained so much more on that one. If there’s one thing I like about how I handled this trade, it’s how I adjusted to market circumstances throughout the trade. I accounted for what was being priced in, and took profit when it seemed like a resistance level was holding. Overall, a pretty solid trade and I’m pleased with the results. Not bad for a couple weeks of tight consolidation! For those of you who joined me on this trade and took home some profits as well, high five! Or in my case, high four! Way to go playaz! I got triggered late last week and that support area between .8650 and .8700 held pretty nicely. Unfortunately for me, the pair couldn’t break past minor resistance at .8750. Instead of worrying over a few pips, I locked in some profits and closed about 40% of my position (my broker requires me to have a minimum amount of units). Anyway, I’ve moved my stop to breakeven and now, so I’m trading on the house! Oh yeah baby, a free ride! For those of you who joined me on this trade and are still holding on, be informed that we’ve got some data (check the BabyPips.com calendar yo!) that could push this pair around a bit. As I speak, euro zone PMI reports are being released, but the report I’m keeping an eye out on for today are the German and euro zone ZEW economic surveys. The German one in particular is expected to choke like Lebron in the 4th quarter, from a score of -15.1 last month to -24.8 in today’s release, so I may decide to close my position earlier and lock in more profits. Nothing wrong with making adjustments on the fly right? Hopefully, this works out for all of us. Good luck to everyone! When fundamentals and technicals align for a trade setup, you know Cyclopip’s down for it! EUR/GBP has been trading sideways for the past two months, and I think now’s a good chance to capitalize on it. As you can see, price is fast approaching a former support area, which dates way back to May 2011 if you scroll back far enough. Furthermore, it just so happens that the lower WATR is also in this area. And as for the icing on the cake, Stochastic is already hovering just above oversold territory. Looks like money in the bank, son! Fundamentally speaking, I don’t see how the pound can sustain its rally. You only need to look at yesterday’s reports to understand why I feel this way. Employment data was disgustingly ugly, and for the first time in a long time, the MPC unanimously agreed to keep interest rates steady. Yes, I understand that the U.K. retail sales report is due in just a few hours and that it could cause a bit of volatility. But I did my research, and judging by some of the past releases, the retail sales report doesn’t usually result in big one-directional moves. And even if the actual results exceed expectations, I doubt it’ll be enough to break this critical support area on EUR/GBP. Truth be told, I’m actually sort of hoping that the report prints better than expected, as it would help me get triggered. Long EUR/GBP at .8670, stop loss at .8600, PT1 at .8758, PT1 at .8887. I’m hoping to enter in that sweet spot between the PWL and WATR. I placed my stop below May’s low at .8600. And I set two profit targets- a conservative one at the WO (.8758), and a more aggressive one at the PWH (.8887). What do you guys think? Let me know by dropping me some comments below, or giving me a shoutout on Twitter or on Facebook! Peace! 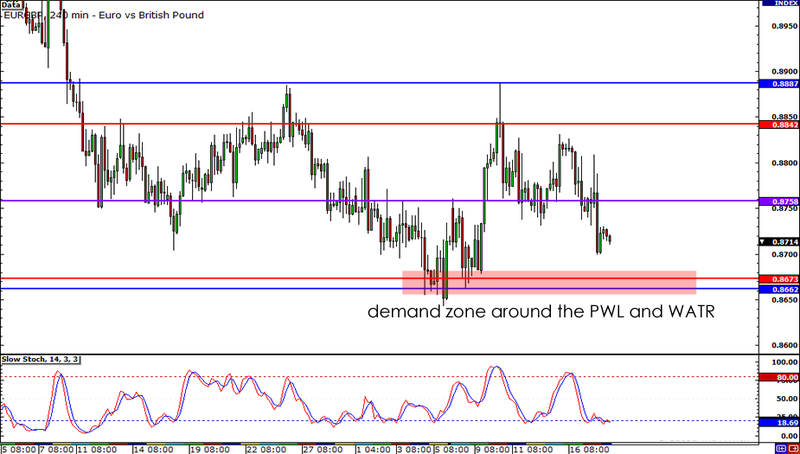 Will the previous week low hold on EUR/GBP?